Having covered a large number of concepts, algorithms, issues, and challenges in robot motion planning, there is little left to state as the conclusion. In this chapter, the authors simply jot down some last words, final thoughts, and closing remarks. While a large number of algorithms exist for the same problem, it is hard to pick out one algorithm and use it upright for a given modeling scenario. It becomes important to understand what features the algorithm has, what is the level of each of these features, and whether these features suit the problem in hand. Optimality and completeness are important factors provided by the algorithm in real time, which may, however, not always be possible. Hybrid algorithms are more tailored in the sense that these algorithms can be customized as per needs. Again, the choice of algorithm plays an important role, as the limitations get added up along with the advantages which we need by design. Hence, it is always important to know what is desired from the robot and the planning algorithm and what scenarios it may face. Most practical scenarios may be simple, such that these can be simply solved by any general algorithm. Other aspects of robotics may be more challenging than a planning algorithm. However, it is certain the ever-rising use of robotics shall bring forth challenging scenarios for robots to work in, in which case the planning algorithms would be tested to best of their capability. Choices play a major role in our everyday life. Be it grocery, cuisine, or mode of transport, we always have a lot to choose from. Picking any one of the available choices, maybe even randomly, may not sound like a bad strategy, since all choices are more or less the same, they mean the same thing to us, or they are short lived—we do not spend our lifetime with the same choice. However, having a large variety of choices in a robotic scenario may not mean the same. Here, the algorithms differ in capabilities; a wrong choice might mean a total system failure. 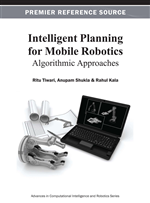 Further, changing an algorithm is always a costly venture, especially having understood that the planning algorithm is ultimately knit to all the other modules of mobile robotics. Now it becomes a critical issue of knowing all about the problem or the modeling scenario in hand which may vary to great extent. Robot operating for cleaning a house may not be the same as the robot doing postal delivery in homes, which may again not be same as the ones working in industry and public places. Robots used for exploration type tasks may be different from those used in oceans, which may again be very different from those used in rescue operations. For many scenarios, it is possible that default or simple choices of algorithms work well. This leaves space to concentrate on the other issues in robotics, rather than only on the planning aspect. In most scenarios, if the algorithm fails to find a feasible path, it may be possible to manually or remotely move the robot, which becomes operational again. In many other scenarios, it does not matter whether the robot takes the optimal route as long as it does the desired work. Hence, these simple scenarios may be easily solved by any algorithm, knowing there is always a backup plan for rescue. This methodology is not something entirely new. Software in its initial cases might be created for the normal inputs, later versions being more sophisticated to deal with the critical or tricky inputs, security aspects, and all. Robot operating for a rescue operation in a cave might have no possibility of user interference due to lack of signals inside. In such a case, it becomes important for the robot to be on its own, and any breakdown means a mission failure. Even in cases where choice of algorithm is critical, simple algorithms may effectively do the job without any error as per the user requirements. Other issues in robotics like the choice of sensors, physical make of the robot, control algorithm, etc. might be more important issues. However, two aspects need to be seen. First, whether the design is made on the basis of the normal inputs that the system has, or based on the exceptional inputs that might someday come into. Robots operating in pre-known environments may not be capable of handling blockage of a path if exceptional cases are not encountered. Second is the importance of optimality of the path. For most life-critical robotic operations, even fractions of seconds can make a difference. For simple scenarios, as well, optimal routes taken over prolonged period of robotic deployment can mean better response of the system as a whole. This puts forth an interesting issue, whether to look at the modeling scenario in hand at its extremity and devise a proper planning algorithm or to just use a simple algorithm that solves the problem in most cases. The first case is the academic school of thought, which demands the algorithm to give results in all kinds of maps. The results need to be optimal and algorithms need to be complete. Real time nature is an important aspect for operations. The basic behavior is simple, account for everything possible, even with the slightest chance. The academic school of thought basically attempts to create a planning framework that best solves the problems with every factor an important indicator to measuring the worth of the algorithm. The other case is the industrial school of thought where the attempt is basically to solve the problem in hand for most cases that one may. It is important that the robot physically performs as per the expectations of the user, users are satisfied and are able to use the system created, robot is able to perform with as little assistance as possible, and overall the system does work. Here, the solution provided may not be proven to be optimal or complete. Clearly, the approach of the book was based on the academic school of thought, unlike the industrial school, which is more relevant when discussing cases of physical robots deployed in problem solving.